Scabies, a very contagious form of skin disease manifests itself in the form of rashes, blisters and is accompanied by severe itching. This disease spreads quickly from individual to individual when they come in close contact with each other. The continuous urge to itch becomes a source of embarrassment, say when you are in public. The mites, who enter the skin, literally leave one miserable as one constantly feels the need to scratch the affected area. This condition becomes more severe during the night thus depriving you of your sleep, leaving you irritable and dejected. At times, such as this, one wishes to have some sort of balm or lotion which would somehow magically quell the itching. It is here that natural remedies come to the rescue. Not only are they safe but they have proven themselves quite well against scabies. Allopathic medicines, no doubt offer relief but some people are not comfortable with the idea of taking strong medicines to counter scabies. For people belonging to this category home treatments come in handy. These home remedies might not offer immediate cure but they certainly provide some amount of relief to the affected person. There might be situations where immediate approach to a medical practitioner is not possible. In those cases, home remedies come in handy. Have you ever heard of Tea tree oil? Well, this oil is very effective against scabies. 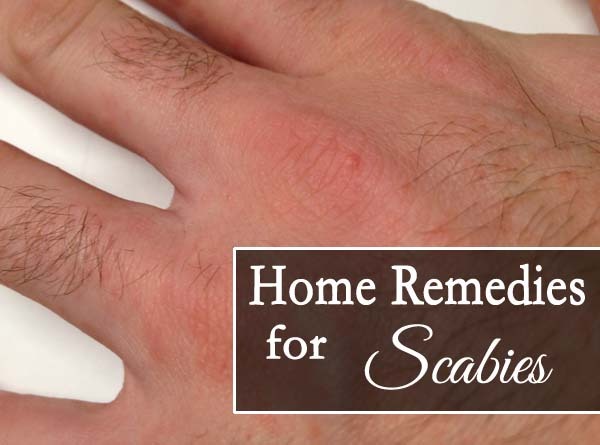 What happens in scabies is that, the mites penetrate the skin and lay eggs. A lot of itching results due to this. Tea tree oil directly enters the skin and kills the eggs reducing infection and killing the eggs in the process. It contains terpenoids which is antimicrobial in nature that successfully destroys all forms of bacterial and fungal infections. Tea tree oil is so effective that even medical practitioners do not hesitate to recommend this. You can either apply the oil directly to the affected area or if you wish, you can mix it with your bath water and take a healing, refreshing bath. Neem oil is highly effective against all forms of bacterial infections. Absolutely no form of parasitic life survives when introduced to neem or its various variants. Neem oil performs an important function of cutting off the reproductive cycle of the mites. Apply neem oil generously to the skin. You will see the itching vanish within 2 days. You can also use neem soap daily as part of your bathing ritual. After your bath apply neem lotion all over your body. Continue with this method regularly for about 2 weeks to see great results. Neem oil substantially reduces the itching and heals the skin. The oil of clove, a known spice is a strong antimicrobial agent. Regular application of clove oil to the affected region will help in drying up the blister and also prevents recurrence of infections. Mix 10 drops of clove oil to vegetable oil and apply it to the skin before going to bed. You can also make a mixture of cove oil, honey and water and use it in your bath. Have you ever drunk bitter gourd juice? Probably not! This juice is so bitter that many people shy away from drinking it. However bitter gourd contains a lot of vital vitamins and minerals such as B1, B2, B3, C, zinc, magnesium, iron, folate, manganese, and phosphorous. It provides immense relief from scabies by helping to dry the blisters, reducing itching and alleviating the pain. Rich in antimicrobial properties it fights infections well. Take a glass of bitter gourd juice and add a teaspoon of lime juice to it. Drink it at one go; after all the sooner you are done with it the better. Bush tea, a plant belonging to the forests of Africa is today available worldwide. Sufficient studies have been conducted on it to prove that it is effective against scabies. It contains anti-inflammatory and anti-viral properties which have the ability to prevent infections from occurring. Borax is highly effective against scabies mites. It contains hydrogen peroxide which seeks out the mites and destroys their outer coating leaving them to die. Add about a cup of borax to your bath water and soak in it for a time so as to allow the hydrogen peroxide to come in contact with the persistent mites. Continue this process daily for about 2 weeks or so to see great results. One can even wash bedding and clothing in borax to prevent further spread of scabies. Rosemary, an herb used in cooking is known to help stop the spread of scabies. Take a cotton swab and apply a paste of rosemary to the skin. It not only decreases the pain but also prevents further breakout of secondary infection. You can prepare a mixture by pouring extremely hot water over rosemary leaves. Allow them to cool and they apply to the skin as many as 3-4 times a day. Turmeric, a condiment is very helpful against ridding the body of scabies. It not only kills the mites but also destroys their eggs preventing further propagation of the mites. Take about a teaspoon of turmeric and add some neem oil to it. Mix it well and make a smooth paste. Apply to the affected area and keep it on till the mixture dries. Wash it after a while. Regularly apply this mixture till you see the blisters drying up and the pain subsiding. Zinc, well known as an anti-bacterial product, is highly potent against infections that occur due to scabies. Zinc is known to repair damaged cells. It is available in the form of tablets and ointments. Crush a few tablets and make a paste out of it after which you can apply it to the affected region. You can also add some turmeric to it to stop the itching. Bleaching can effectively dry up the scabies helping you get better quickly. Fill the bathtub with water and add adequate amount of bleach to it. Soak in the solution and then take a shower to rinse off the extra bleach. A similar method involves the use of cayenne pepper. Mix cayenne pepper into warm bath water and soak in it. Of course, be careful that it doesn’t get into your eyes. Cayenne pepper burns the blisters and bumps caused by scabies without harming the skin as such. Make a body lotion at home by adding about 1 part sulfur to about 10 parts of an unscented body lotion. Apply this on the affected area. This soothing lotion will provide you immense relief. Take permethrin and add petroleum jelly to it. Basically, you have to dilute the mixture a bit. Apply it to the portion affected by scabies and keep it overnight. Don’t forget to wash it off the next morning though. Scabies is a persistent disease, refusing to leave. It is therefore necessary that the entire household gets treated even if the rest of the members do not show any symptoms. Make sure to wash all the articles of clothing used by the person suffering from scabies so as to prevent any form of further spread of the disease. One must also continue with these home based remedies for about two weeks or so to completely destroy the mites. Go the natural way and experience great results without the added tension of unwanted side-effects.